So Here's What Our FAV Celeb Kids Are Up To! We love to keep up with our favourite celebs, sure, but what we also enjoy is keeping up with their super-adorable kids! While we're waiting for them to star in their own Bollywood movies, here's what they've been up to! Suhana Khan is daddy's little girl, and this totally adorable collage she posted proves that! We can tell already that she's going to grow up to be a total rockstar, just like her father! Last we heard, Navya was prepping for her formal introduction to society in Paris. And now we see her celebrating her 18th birthday party at a bash that could make anyone a bit jealous! Salman's nephew and Saif's son coming together to do an SRK dubsmash! Aren't these two just the best? We only wish to see them onscreen together one day… It could be an EPIC jodi! Aalia Ebrahim has made us certain about one thing… She's as bold as she is beautiful! She looks absolutely gorgeous in all of her photos but she's also made sure that people know she's more than her looks! Alaviaa never fails to stun us with her updates on social media. We think she gets more gorgeous every day and her feed just goes to support that theory of ours! Don't you agree?! 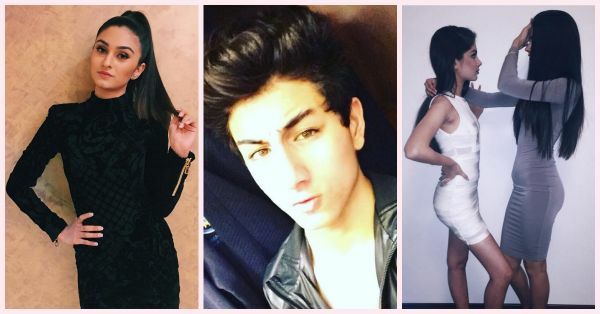 MUST-READ: 7 Celeb Kids Who Are Sure To Take Bollywood By Storm! MUST-READ: #Aww: Our Fav Celebs Posted The Most ADORABLE Diwali Pics!